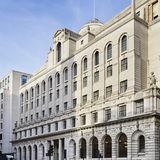 "Set in the former Midland Bank building, The Ned was designed by Sir Edwin 'Ned' Lutyens in 1924. 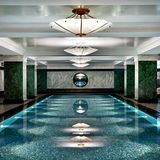 The heritage building opened in May 2017 and hosts nine restaurants, 252 bedrooms channeling 1920s and 1930s design, a range of men’s and women’s grooming services (Barbour & Parlour) and ‘Ned’s Club’, where members have access to a rooftop pool, gym, spa, hamam and late night lounge bar." Our restaurants are child-friendly until 8pm. All bars, the spa and basement pool areas are just for adults at all times. Children can use the roof-top pool between 7:30am and 11am daily. A complimentary children’s menu is served daily between 5pm and 6pm in Millie’s Lounge for children under the age of 12. A children’s in-room menu is also available 24 hours a day. What did you think of The Ned? 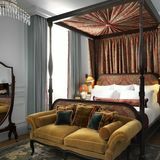 A stunning, beautiful building - a great addition to London's hotel scene. I visited The Ned on Wednesday, although I didn't stay over I enjoyed spending some time in the busy bar - a great buzz and a fantastic place to while away some time people watching. I look forward to staying at the hotel and actually seeing the rooms and the spa etc. 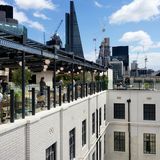 The Ned is a stunning, beautiful building - a great addition to London's hotel scene.